Carrot juice is filled with great vitamins, minerals, beta carotene and more. Carrots are ma great addition to soups, salads and juices. Carrots are especially good for the skin, eyes, digestive system and teeth! I personally struggle with carrots because I am not fond of them, however, I am always on a quest to find recipes that make disguise their flavor because I know how important they are to my diet. 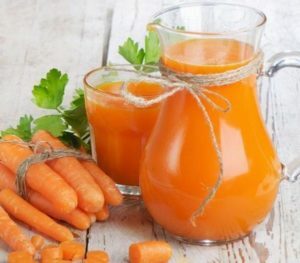 I found some really great information about the benefits of carrots along with a great recipe for carrot juice here in this article on positivehealthandwellness.com. I personally love the recipe for Carrot Juice with Lemon and Ginger!